The last round of the Nigeria Premier League 2012 was played on 07.09.2012 and Kano Pillars FC are the champions. Below is my unofficial list of the highest scorers in the league. Please note that there are some uncertainty regarding scorers in the Nigeria Premier League. Various sources will say that different players have scored certain goals. Whenever I read about such uncertainty, I usually credit the goal to the player with most independent, trustworthy sources backing him up as goalscorer. 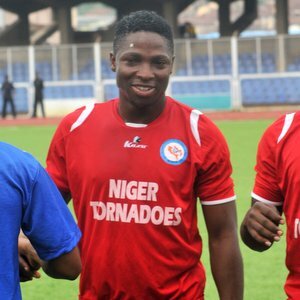 Most sources will agree that the top scorer of the Nigeria Premier League 2012 is Sibi Gwar (born 09.09.1987) of Niger Tornadoes FC. Gwar, a dynamic, hard-working striker with excellent finishing, has lately worked hard to secure a deal in Israel but so far no transfer has been concluded. The picture of Gwar was found on bimboadeola257.blogspot.com. Thanks for the list, but on the final day, it was reported that Gambo Mohammed scored for Pillars.